… for the water filtration industry with 99.9% reduction of an exhaustive list of the toughest to remove contaminants. Don’t settle for less. Clean. In combination with the Fluoride-Arsenic shield, this is the only domestic filter to remove lead, arsenic, fluoride, and other harmful contaminants to 99.9%. Safe. Only water ionizer filter to be tested in a US EPA / NELAP Certified Independent Laboratory to government standards. Research. Only water ionizer filter created using WQA certified water specialists, engineers, and doctors. Natural. 100% chemical free, all-natural and sustainable media. The X indicates what filter will fit in your ionizer. If there are multiple X’s, it means you can choose what filter you want. For further information on ordering filters please call us on 1 877-770-5247. 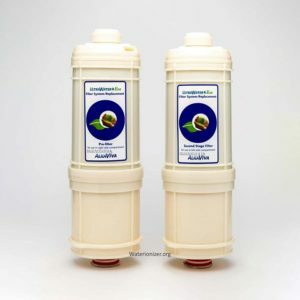 * The Biostone UF (Ultrafine) filter is especially useful for use with well-water, or for people with higher than usual sensitivity to bacteria and other contaminants. It is not necessary to order an Ultrafine filter if you are on municipality treated water.